Whether you know it or not, your ducts may be clogged with dust, bugs, mites and other material. This can be harmful to your heating and cooling system as well as to your family’s health. Thankfully, A.J. Perri offers professional duct cleaning services to our New Jersey neighbors. A.J. Perri can come in and remove that material from your ducts, leading to a cleaner, healthier and more comfortable home so you can, literally, breathe easier. You and your family spend more time indoors during the hottest and coldest months, so indoor air quality becomes more of a concern. Everyday life in your home generates material that can contribute to clogged ducts: dust, pet dander, and chemical pollutants. All of that material is going to be recirculated in your home 5 to 7 times every day. And while it’s true that dirty ducts do not necessarily mean unhealthy air, they may increase your risk of negative health effects. This is especially true if you have loved ones with asthma or allergies. A duct cleaning from A.J. Perri can help with these issues and improve overall indoor air quality. It’s well known that dust in your ducts causes your home’s heating and cooling system to work harder and can shorten its lifespan. The result is wasted energy. In fact, according to the U.S. Department of Energy, between 25 and 40 percent of the energy used to cool and heat your home is wasted. During your A.J. Perri professional duct cleaning, our technicians will use specialized tools to dislodge dust, dirt, and debris from your airflow systems. This is followed by a sanitization process and the cleaning of various forced-air heating and cooling components such as vents and grills. 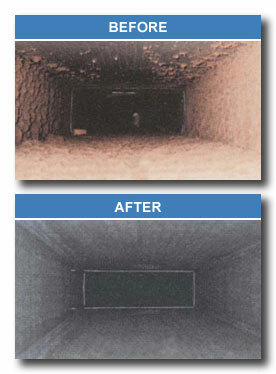 Our thorough duct cleaning service should take around 3 to 4 hours to complete per system*.